Sunday brunch can be so elegant and intimate, and yet, until recently, we haven’t really seen this style of wedding reception as a popular option among many couples or wedding planners. But that’s starting to change as couples and wedding planners clue in to the benefits of a Sunday brunch reception. Not only can a Sunday Brunch Wedding Reception be very stylish and memorable, its actually a very cost effective and budget-friendly alternative to a traditional dinner reception – without skimping style or hospitality. Part of a wedding planner’s role is to point her clients towards options they may not have considered themselves, but which are really ideal for them. You can help couples who are on a budget save money on their weddings by recommending they go with an elegant Sunday brunch for their reception. Because a brunch reception is shorter in duration that an evening dinner reception, the cost is always going to be less. than a sit down dinner in the evening. There will be less consumption of liquor, so that makes for a huge cost savings as well. Any costs of music or entertainment for the reception will also be drastically reduced due to the shorter length of time. Are you starting to see the appeal? An early day reception is always more affordable than an evening reception. There is less competition for venue space early in the day, and venues are happy to have the business at a non-peak time when their venue might otherwise sit empty, so the prices are generally more competitive. As an added bonus, a brunch wedding reception also offers an opportunity for a more unique and personalized wedding day experience for everyone – the couple, as well as their guests. A late morning wedding would typically have guests arriving at the reception around mid-day. Greet them with custom lattes and fresh mimosas (champagne cocktails). 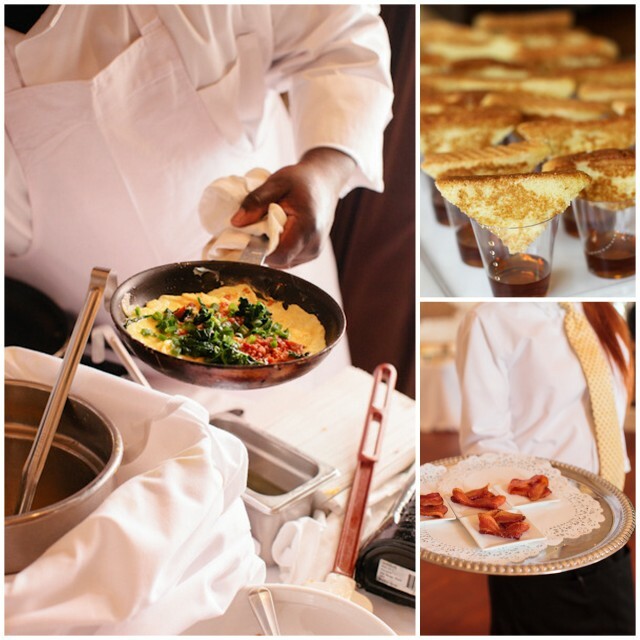 Create a light and brunchy feel for the mid day reception meal by offering guests brunch favorites like strawberry french toast, pancakes and quiche. After brunch, let guests go on with their day while the wedding party take pictures and then let the couple slip away for some private time to relax and refresh. The wedding festivities could end there (the most cost-effective option for a couple on a budget…), or the couple could invite their guests to join them for drinks and dancing later in the evening (no meal), starting at 8pm. Pass canapes or serve wedding cake or have a dessert table for refreshments. The evening is a chance for the couple and their guests to change attire (think second dress!) and host (or be hosted by) family and friends at a smaller intimate meal with just the wedding party before the night of dancing begins.